Devin Haney laughs when asked how he manages to handle life in the glare of the boxing world’s spotlight so well at the age of 20. “That’s funny that you say that because coming up, there was a rumor going around some boxers when I was 17 saying that I was lying about my age,” said Haney, who is indeed 20 years old and doing better than most navigating the often turbulent waters this sport can throw at the young and talented. The proof is on his Instagram page, where you will find photos of a young Haney with the likes of Zab Judah, Floyd Mayweather Jr. and Sr., and Mike Tyson. It was evident early on that Haney was a special boxer, and he had the 130-8 amateur record to back that up. His age did hurt him when he was deemed too young for the 2016 Olympic squad, so he opted to turn pro at 17 instead of waiting for the 2020 Games. That decision is paying off now, with Haney now 20-0 with 13 knockouts. In 2018, the Las Vegan took that leap to the next level of competition, stopping 33-2 Mason Menard in May and then decisioning former world title challenger Juan Carlos Burgos in September. More than winning, Haney has impressed while doing so, showing that his game is evolving as his competition is rising. But with such dominant wins come the criticism that he hasn’t been tested yet. So has he? It’s getting to that point where he will have the opportunity to prove that to the world. Haney is on a collision course with 21-year-old phenom Teofimo Lopez (whose first-round finish of Menard in December effectively took him from prospect to contender), and there’s also more up and comers like Ryan Garcia, Shakur Stevenson and Karlos Balderas all in or around 135 pounds. But for now, Haney has to deal with 25-0 South African Xolisani Ndongeni. The ShoBox-televised bout on January 11 is a risky one, given the history of virtually unknown fighters from Africa coming to the States and giving a rude awakening to highly-touted opponents. But Haney knows what he’s in for in Shreveport, even if he’s not scouring the internet for tape on his foe. It’s worked so far for Haney, who is getting a little antsy about taking the next step in his career. Efe Ajagba, 24, heavyweight: In five fights this year, the heavy-handed, 6-feet-5 Nigerian scored four first-round knockouts and made one infamous opponent, Curtis Harper, walk out of the ring before their bout even began. Nigeria’s Ajagba, a 2016 Olympian, takes a 9-0 record, including eight knockouts, into 2019. Joshua Buatsi, 25, light heavyweight: The hard-hitting Buatsi showed impressive power while knocking out five of his six opponents in 2018. The Ghanaian-born, London-based Buatsi (9-0, 7 KOs) might emerge as the best pro from a 2016 British Olympic team that included Joe Joyce, Josh Kelly and Lawrence Okolie. Jaron Ennis, 21, welterweight: This Philadelphia native easily handled his two slight steps up in competition when he stopped Armando Alvarez (18-2, 12 KOs) and Ray Serrano (24-6, 10 KOs, 1 NC) in the third and second rounds, respectively, in two “ShoBox” main events. Ennis (22-0, 20 KOs), an uncommon combination of speed and power, knocked out each of his five foes in 2018. Shakur Stevenson, 21, featherweight: Training alongside Terence Crawford has had a positive effect on this 2016 Olympic silver medalist. If the Newark, New Jersey, native continues developing power to go along with his hand speed and overall skill, Stevenson (9-0, 5 KOs) will win a featherweight world title sooner rather than later. Daniyar Yeleussinov, 27, welterweight: This 2016 Olympic gold medalist from Kazakhstan made his pro debut April 28 and got off to a strong start to his pro career this year. Yeleussinov (5-0, 3 KOs), a strong southpaw, knocked out Nicaragua’s Marcos Mojica (16-3-2, 12 KOs) in just his fifth pro bout. EDITOR’S NOTE: BoxingScene.com’s awards panel determined Teofimo Lopez has surpassed the prospect stage, despite that he has just 11 professional fights. Otherwise, the undefeated lightweight would’ve received serious consideration for this award. 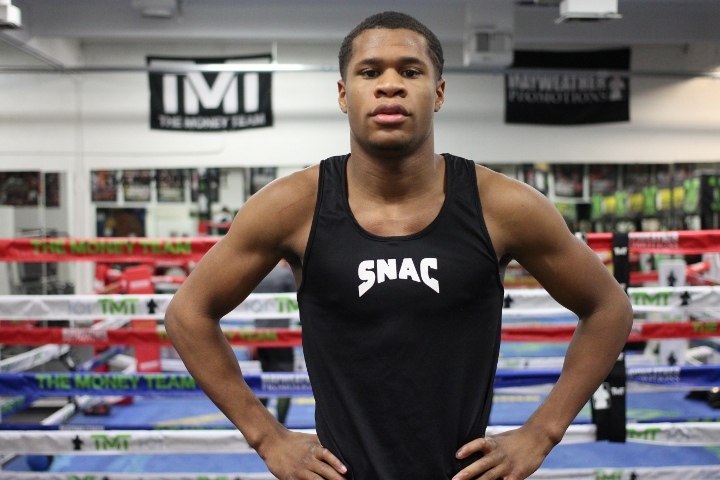 And yes, we realize Devin Haney has nine more pro bouts on his record than Lopez. Pacquiao: If No Floyd – Bring on Thurman, Spence, Garcia, Porter! Jermall Charlo: 100% I’m One of Most Avoided Fighters at 160!